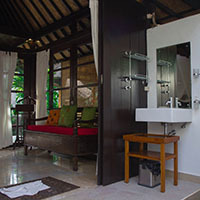 At Lodtunduh Sari , each villa and cottage is a private sanctuary. A beautiful recluse in which to meditate, receive massages, write a love letter or a poem, paint, or simply sip a drink and contemplate nothing. Whatever your agenda holds, each space is designed to make you feel rejuvenated, fresh and in your own zone. 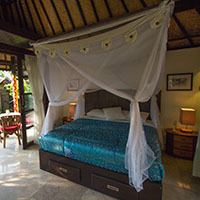 All rooms have a comfortable double 4-poster bed with mosquito net and feature en suite open-air bathroom. Lodtunduh Sari's exclusive two bedroom villas are named Kupu Kupu, which translates to butterfly, and Madu, which means honey. Kupu Kupu and Madu can accommodate up to 6 people. 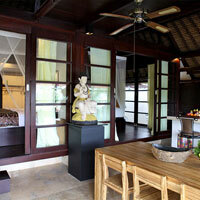 These two air-conditioned villas comprise 2 bedrooms, each with a king-size bed and outdoor bathroom. 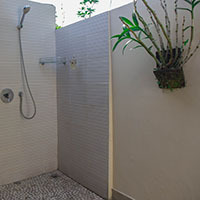 The main bedrooms also have a built-in day bed, and a bathtub. There is a loft area with extra bedding and study. The bedrooms give onto a spacious lounge and dining area with a fully-fitted modern kitchen. Open the doors and step out to a large, furnished private deck overlooking the large pool and with spectacular views of the rice fields and mountain. Make the most of your Kupu Kupu or Madu experience by allowing us to arrange a private organic chef, maid, driver, masseuse whatever your whims, the staff at Lodtunduh Sari are at your service. All bedrooms are air conditioned, and have private open-air bathrooms, undercover decks, surrounded by their own garden ponds and terraces. There is a guest pavilion that is situated on the edge of the pool, enjoying the beautiful views. The pavilion houses a bar, kitchen eating and lounging areas, with the la carte restaurant offering delicious Balinese and International dishes. Ubud is just a three minute drive or 15 minute walk from Lodtunduh Sari, located on the outskirts of Ubud. 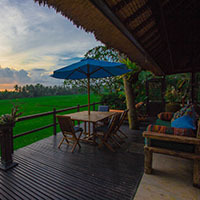 The main streets of Ubud abound with outstanding attractions such as "Monkery Forest", "Elephant Park", world class restaurants, bars and shopping-Ubud is a thriving traditional village.